3DFoil is a design and analysis software for wings, hydrofoils, sails and other aerodynamic surfaces. It requires a computer running MS Windows 7,8 and 10. I wrote the 3DFoil software several years ago using a vortex lattice approach. The vortex lattice method in the code is based on vortex rings (as opposed to the horse shoe vortex approach). The vortex ring method allows for wing twist (geometric and aerodynamic) so a designer can fashion the wing for drag reduction and prevent tip stall by optimizing the amount of washout. The approach also allows sweep (backwards & forwards) and multiple dihedral/anhedral angles. Another feature that I designed into 3DFoil is the capability to predict profile drag and stall. This is done by analyzing the wing cross sections with a linear strength vortex panel method and an ordinary differential equation boundary layer solver. The software utilize the solution of the boundary layer solver to predict the locations of the transition and separation points. 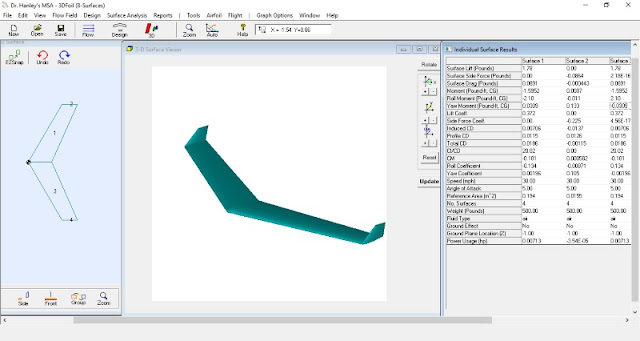 The following video shows how to use 3DFoil to design and analyze a flying wing UAV aircraft. 3DFoil's user interface is based on the multi-surface approach. In this method, the wing is designed using multiple tapered surface where the designer can specify airfoil shapes, sweep, dihedral angles and twist. With this approach, the designer can see the contribution to the lift, drag and moments for each surface. Towards the end of the video, I show how the multi-surface approach is used to design effective winglets by comparing the profile drag and induced drag generated by the winglet surfaces. The video also shows how to find the longitudinal and lateral static stability of the wing. 2. Input the dimensions and sweep of the winglet. 3. Join the winglet and main wing. 4. Generate the full aircraft using the mirror image insert function. 7. Look at the contributions of the surfaces. 8. Verify that the winglets provide drag reduction. More information about 3DFoil can be found at the following url: http://www.hanleyinnovations.com/3dfoil.html.